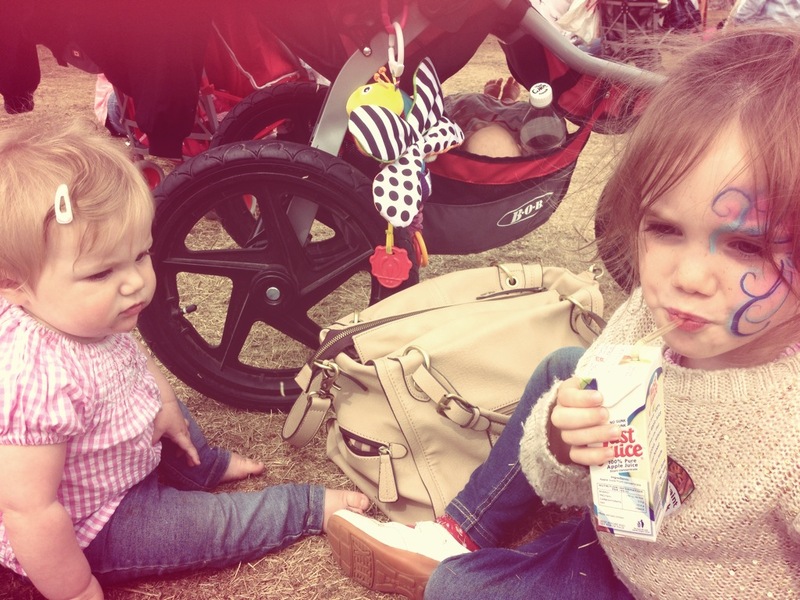 Yesterday Daisy, Evie and I went to the Lollibop festival at the Queen Elizabeth Olympic Park in Stratford. Still high on the whole Camp Bestival experience, and after hearing SO many positive stories about last year, we were all really, really, REALLY looking forward to it. 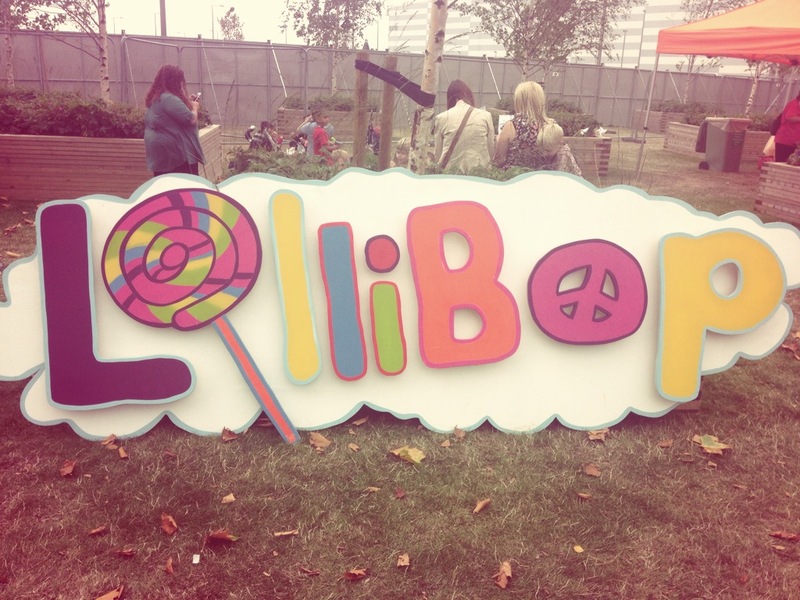 Lollibop is now in it's fourth year. It's the UK's biggest kids festival and EVERYTHING is aimed at kids under 10 and their families. Aside from all the live acts and character meet-and-greets, there are also disco sheds and crafting tents and play areas.... You can imagine why we were so excited about going. The line up sounded amazing, and the fact it was taking place in the Olympic Park, somewhere we'd not visited before, made it sound like the perfect day out for us! Sadly, that wasn't the case. I hate being negative about something that someone has worked so hard to create but, the fact is, none of us had a particularly good time - and it's only fair that we're honest about it in our review. It all started with our journey there. Ours was very long (almost 3hrs each way) and involved two trains and one tube. I was pretty disappointed that there was nothing on the Lollibop website to pre-warn us that the festival site was a 20 minute walk away from Stratford Underground station. If I'd known that beforehand, I'd have been a bit more prepared and taken our Orbit pram with the buggy board instead of our BOB stroller, as the walk was a bit too much for Daisy's little legs. I ended up giving her a piggy back for half of the way (whilst pushing the pram, I hasten to add) which wasn't a good start for me. That aside, there were lots of lovely, helpful people showing everyone the way and getting us across the main roads safely which was really well thought out and organised. Once we got to the park, the queues to get in were ridiculous, although thankfully we were fast tracked in through the blogger's entrance. That didn't save us once we got inside though and the crowd ahead of us was just insane. Admittedly we arrived at 11am, which was a very busy time, but if you're going to a one day festival you want to get there early-ish and spend the whole day there! My biggest problem with the whole day was the sheer amount of people there. You couldn't get around anywhere. Trying to fight your way through the crowd with a buggy and a 3 year old was like fighting a losing battle and there were LOTS of grumpy people there, presumably unhappy for the same reason. Because of the crowds, to begin with we just loitered round the Village Green where it was a bit quieter. 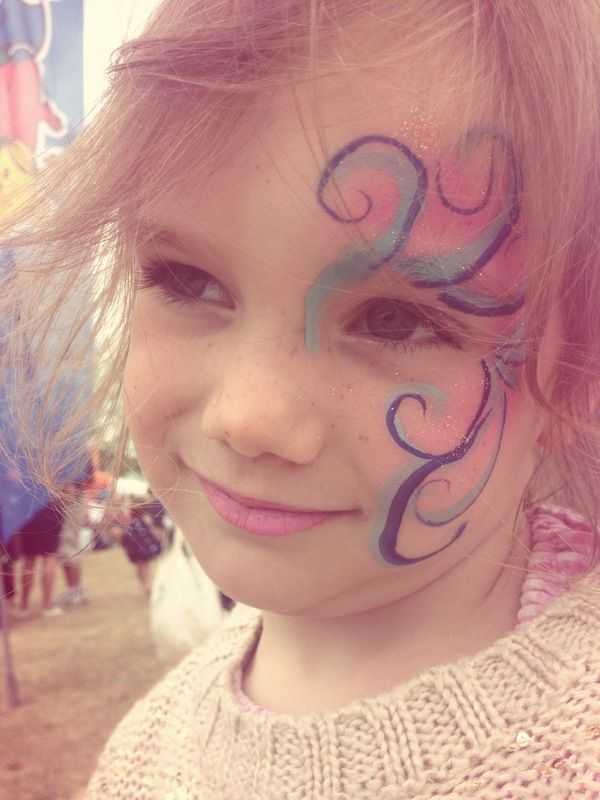 We queued to get Daisy's face painted and crossed our fingers that the crowds of people would disperse and we'd be able to get around easier later on. But it wasn't to be. When it was time for lunch we pushed our way in towards the food stalls surrounding the main stage (there was a massive bottle neck of people just before the main arena) and then we were yet again confronted with huge queues and crowds. The only lunch options we found were burgers, steak burgers, hot dogs and Nandos. Oh and chips. Lots of chips. Nothing particularly kid friendly - or easy on the pocket either, as I found out when I had to fork out £18 on one adult burger, one kids burger, one portion of chips and two cold drinks. behind the side of the stage, or behind a huge inflatable flower. 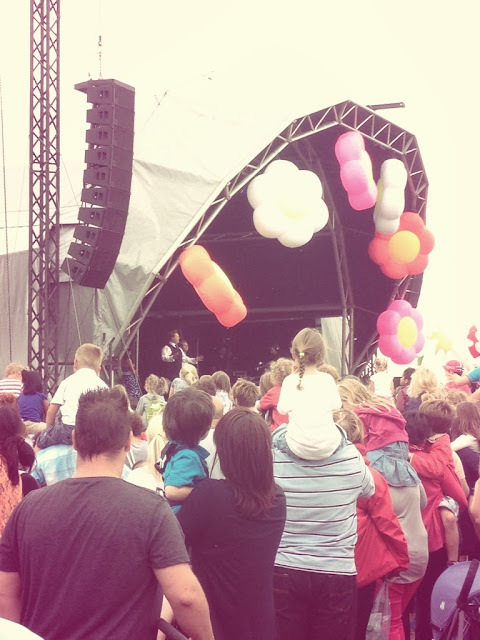 It has to be said, the line-up was brilliant and, prepared to put the beginning of the day behind us, we managed to find a spot to the left of the main stage for Hello Kitty and Cbeebies superstar Justin Fletcher. These were two of the acts Daisy was most excited about seeing. Sadly, though, neither of them thought to come out to the front of the stage whilst performing and, despite being on my shoulders, Daisy only managed to catch tiny glimpses of them both. A little bit miffed, we thought we'd try some of the Imagination Stations and the baby activities, however the queues were (yet again) ridiculously long. Kids just aren't prepared to wait that long for something! We spent ten minutes back on the Village Green where Daisy played in some little wooden houses (which we could have done in our local park) then we ended up having an ice cream and fighting our way back through the crowds to head home. We spent 3.5 hours there in total and Daisy was so disappointed. 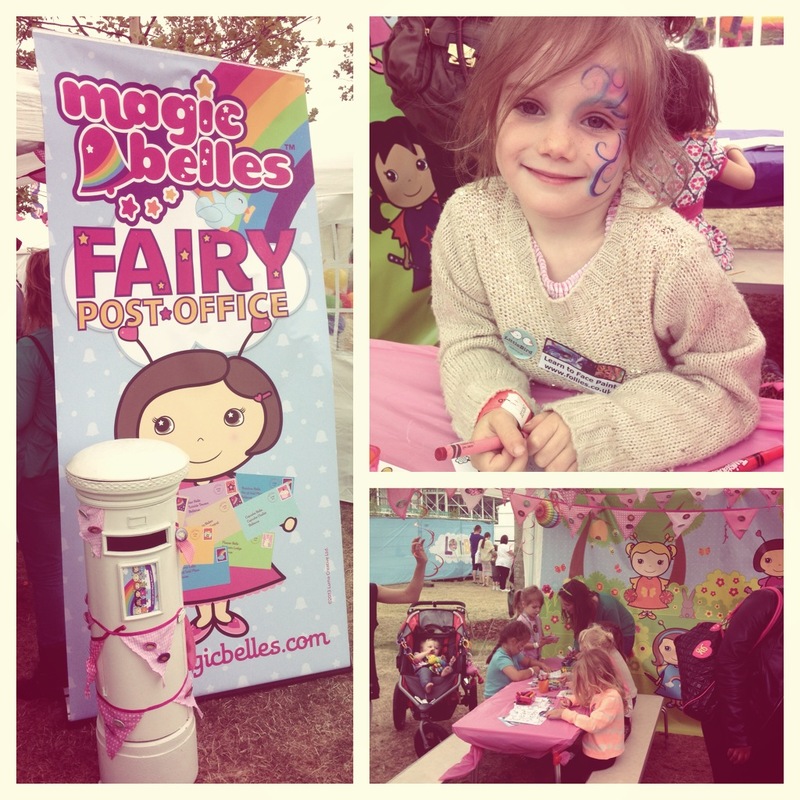 - The Magic Belles tent. This was Lollibop's saving grace.... we could have spent all day here! The Magic Belles iPhone app is one of Daisy's favourite games and she was SO excited to be able to colour in and send a postcard to them! The tent was beautifully decorated - perfect for girlie little girls. A huge thumbs up to the Magic Belles team! - The fabulous - and free! - facepainting thanks to Follies Face & Body Painting. We queued. For ages. Daisy decided to be a 'swirly whirly Princess'. I got my purse out... and was told to put it away. Amazing! 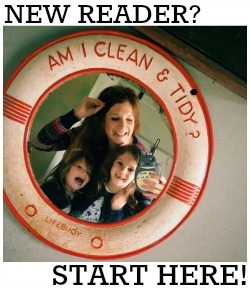 - No queues for the toilets! HURRAH! Definitely a plus and so worth a mention. We went to the loos twice and didn't queue either time. Plus there were heaps of baby changing loos which meant we could take Evie and the buggy in with us too (thank God - not sure what we'd have done with her otherwise!!). - The journey there. Travelling time aside, the walk from the tube to the venue was too far in my opinion. - The fact it was SO busy. I've got no idea how the organisers thought they could fit that many people in comfortably. I'm not kidding when I say you couldn't move. You REALLY COULDN'T. - The main stage. It was positioned at the furthest point and there was a bottle neck to get in which meant more queueing and huge crowds where little people could get lost in all the pushing. Not very pleasant or well organised. Then the acts inability to perform at the front of the stage was really disappointing. I would estimate that half of the crowd had the same problem as us. - Serious lack of decent, healthy food. I HATE CHIPS! It's a kid's festival! Surely they could have had even a sandwich stall? If there was one then it was impossible to find - perhaps details of the food sellers could have been listed on the programme? - Lack of programme sellers. We saw people with their lanyards around their necks but couldn't find any sellers for love or money..... until we left. Then we saw two. Oh no, a shame it wasn't a better day out for you all. These kind of events do seem to overfill, which is a real shame as little ones really don't like to wait for too long. Can't believe there weren't healthier food options! I'm glad you were so honest, I was thinking about going next year, but if in the same venue, don't think I'll bother. PS Completely agree about location/journey/food and bottlenecking! Sorry you didn't have a good day there but now I don't feel so gutted that we couldn't go. Don't think I'll risk it next year then unless they change it a bit. From what we've seen about the event it sounds like fun, but have to agree that overcrowding at events like this would spoil the day. It's a shame it ruined the experience for you.